In the 1980s were a spate of science fiction films for the whole family. War Games was one of the best of them. An underachieving teenager, David, (Matthew Broderick) spends his time online via the acoustic coupler of the day. He dials multiple phone numbers looking for computers, which costs nothing because he's hacked into the phone company and he figures he's under 18, so no prosecution. In an attempt to impress the pretty girl behind him in class, Jennifer (Ally Sheedy) he hacks into the school computer and gets them both out of summer school by changing their grades. They also find an anonymous computer while looking for a gaming company. It has games on it so why not play? How about global thermonuclear war? Is this about my grades? A bit of research and they're in. It's all fun and games until the Feds turn up and grab him. 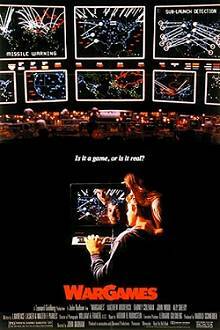 In NORAD he meets the man running the war room computer McKittrick (Dabney Coleman) and David discovers that despite his efforts, the computer is still playing. He believes that only the computer's creator, the long dead Falken (David Warner) can stop the computer from making the game real. It's fun, the war room looks great (who cares if they got the DEFCON ranking the wrong way), and it's got a cast who take it seriously under the helm of John Badham. The technology may date, but the issues haven't.